Very charming Rockport bungalow, completely renovated after Hurricane Harvey, in desirable Little Bay location. You can walk to the water, walk or ride bikes to Key Allegro and many restaurants in Fulton. House has 2 bedrooms with Queen size beds and bunk room that has a full size bed and one bath. The kitchen has custom cabinets, stainless appliances, granite countertops, very cute! Backyard is spacious with a table ready for six to sit and enjoy home after the beach or fishing. All new flower beds, new fencing, and new sod. Looks lovely! Garage stores your water toys, fishing gear, has full size washer and dryer. Parking is sufficient for 2 or 3 vehicles and a boat. We lost our climbing tree in the front yard in the storm but new yard has been installed and looks great. My husband and I are from Central Texas and have always shared a love for the Texas coast. 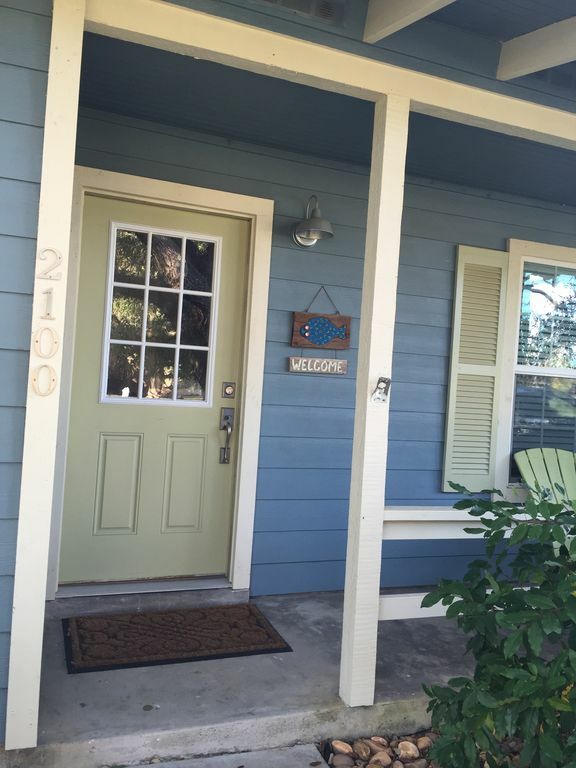 Having traveled with our children to Rockport and Port Aransas for 20+ years, we knew that this was the ideal place to have a home. Having traveled to Rockport for leisure for many years, we finally had the opportunity and a reason to spend time there due to business. We were renting hotels and spending a lot of money and finally decided that we should look into purchasing something of our own. After looking around town, we fell in love with the look, feel, and location of Little Bay. The enormous oak trees, charming 1950's and 1960's bungalows, and the close proximity to town and the water made it a desirable location for us. After searching and viewing all of the listings in our price range, we were about to give up. Our agent called us with one last listing to view. As I drove up to the home on Picton, I knew without a doubt that this was our home. We immediately put it under contract and starting planning what would become a very extensive remodel. Six months later, we had the cottage bungalow of our dreams. Every visitor that we have ever had to the home comments on how charming and lovely the home is. Its very special to us and we hope you will feel the same way. Beautiful remodeled kitchen with granite countertops, new appliances, custom cabinets, stocked with all utensils, pots and pans, plates, and glasses that you will need. We really enjoyed our 3 month “staycation” at Tres Ninas. It was clean, comfortable and very tastefully decorated. (Loved the beach theme.). The location was close to restaurants, shops and the water. The fenced back yard was perfect for our dog as well. The property was well managed and our needs were attended to promptly. Quiet neighborhood - close to anything you would need. Very cute and clean house that could comfortably sleep seven people. Our pooch enjoyed the spacious yard to run in. We enjoyed our stay and was very pleased with the house ! This rental was perfect for our 4 day fishing trip. The driveway only fits the boat and truck, the other 2 vehicles were able to park in front of the house on the street. The home is decorated to a tee, is cozy and has everything you need for a couple days, so I highly recommend it. Great place to stay. House was clean with all the amenities. Would definitely stay there again.